How do you know it’s been a good party? Your host discharges the next day’s duties in the previous night’s tuxedo. That’s how Master of Ceremonies Eddie Muller brought down the curtain on the tenth Noir City Film Festival. How do you end a noir film festival in San Francisco? By paying homage to the man who put the city’s darkest streets on the map. The final line-up featured six films based on the work of Dashiell Hammett. Many hardy souls stayed for the full half-dozen. I opted to forego the movies I’d already seen – The Glass Key (1942) and the 1931 and ’41 versions of The Maltese Falcon – in favor of the curiosities. A sound plan, because as it happened I would have other pilgrimages to make. Roadhouse Nights (1930). This pre-Code rarity, shot at the Paramount studio in my old neighborhood of Astoria, New York, is allegedly based on Hammett’s brutal Red Harvest, but it would take a copyright lawyer armed with an electron microscope to find any trace of it. I don’t recall that bloody book having many musical numbers. A Chicago reporter digging into the bootlegging background of a Michigan club owner gets ventilated for his trouble, and his perpetually soused colleague (Charlie Ruggles) picks up the trail. Jimmy Durante contributes a few cherce bits. It lurches along for most of its 68 minute running time, but the great screenwriter Ben Hecht concocts an ingenious and wholly satisfying wrap-up. 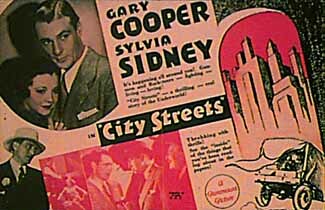 City Streets (1931). In the year since Roadhouse Nights, cinematic storytelling had vaulted forward. Directed by Rouben Mamoulian and shot by Lee Garmes from Hammett’s only original screen story, City Streets proved to be the big discovery of the festival. Sylvia Sidney is the gunsel’s daughter trying to walk the straight and narrow with her carny sharpshooter boyfriend Gary Cooper. In order to save his girl, Coop is soon pulling triggers for the local beer mob. The first American movie to use the noir staple of voiceover, Streets also seems to be inventing other key bits of cinematic grammar. Mamoulian’s striking compositions, Garmes’ photography and some still-impressive editing tell much of the tale. It’s a film that spans eras – the early extended Cooper/Sidney courtship owes something to Murnau’s Sunrise, while the later scenes prefigure the gangster dramas that would follow in the 1930s – and deserves to be far better known. Mr. Dynamite (1935). They can’t all be winners. This one was, as the French critics who coined the term noir say, a steaming pile of crap. The backstory, relayed by Hammett historian Vince Emery, was far more interesting than the onscreen saga of shamus T. N. Thompson. Hammett had been asked to create a Falcon follow-up about a Sam Spade-style private eye who turns bad. Rejected by the studio, it was dusted off and revised by other hands in the wake of The Thin Man’s overwhelming success. The result is an ungainly hybrid of the two styles Hammett made look so effortless. The kind of movie where you see the stellar cast of nobodies and assume the names were plucked at random from the phone book. Nightly Cocktail Report: One of the most-storied bars in America, literally and figuratively, is Smuggler’s Cove. It specializes in “traditional drinks of the Caribbean islands, classic libations of Prohibition-era Havana, exotic cocktails from legendary tiki bars.” Having just read Wayne Curtis’ And a Bottle of Rum: A History of the New World in Ten Cocktails along with Charles H. Baker, Jr.’s eminently wise A Gentleman’s Companion, I knew a stop would be in order. My first drink, the El Presidente – white rum, French vermouth, orange Curaçao and fresh grenadine – was a marvel. But it was a mere precursor to what followed. Baker rhapsodized about the Hotel Nacional Special, born of Cuba, made with golden rum, lime juice, apricot brandy and pineapple juice. Presumably he did not have chunks of fresh pineapple blended into a gossamer froth before his eyes. Easily one of the best cocktails I’ve ever had. I would have gone deeper into the Cove’s extensive menu, but as it happened I had places to be. The apartment that Dashiell Hammett lived in while he wrote Red Harvest and The Maltese Falcon, which also served as a model for Sam Spade’s own quarters, is at 891 Post Street. The current owner has taken pains to restore the apartment to 1920s condition, down to the can of coffee in the kitchen. Muller has a key, as evidenced by this San Francisco Chronicle article. He had arranged to show the renovations to Hammett’s granddaughter Julie Rivett and scholar Richard Layman. And somehow, Rosemarie and I were invited to tag along. I’m still not sure how that happened. So that was how my San Francisco Noir City experience ended. While 1400 people sat in the Castro Theatre watching Spade and the Fat Man haggle over the Black Bird, I was in the room where the book was written with one of the author’s descendants, hearing about how the stories for the films I’d watched that day were being collected for publication for the first time. There aren’t any ghosts in the apartment, but the sense of what inspired Hammett about the city is very much in evidence. A reminder: the Seattle version of Noir City, with a largely different series of films, begins three weeks from today. The missus and I will be there selling Film Noir Foundation merch in the lobby. Come on by.